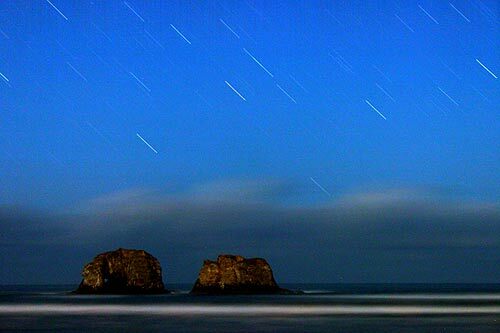 (Oregon Coast) – (UPDATED: dates of meteor shower added.) Yet another awesome set of heavenly bodies is putting on a stellar show above Oregon, Portland and the Oregon coast. If you're up in the wee hours, just before dawn, you'll see two very bright planets – and there is a spectacular meteor shower coming up in late October. 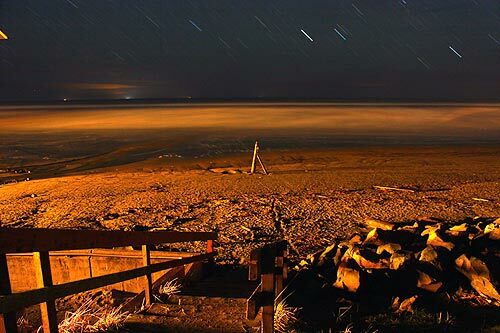 (Photo above: Venus and Jupiter made a stunning convergence on the Oregon coast this summer, seen here in Seaside). 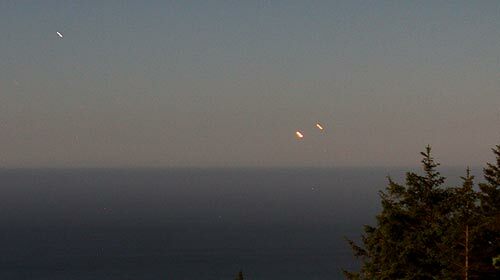 Jim Todd, astronomer with Portland's OMSI, said they have been receiving numerous calls recently on bright objects in the morning sky above the horizon. Taking place just before sunrise, it's Venus and Jupiter making a doozy of a display. Todd said Venus is rising into view along the eastern horizon, and it's coming up earlier and earlier each day. Jupiter is also making an impression. 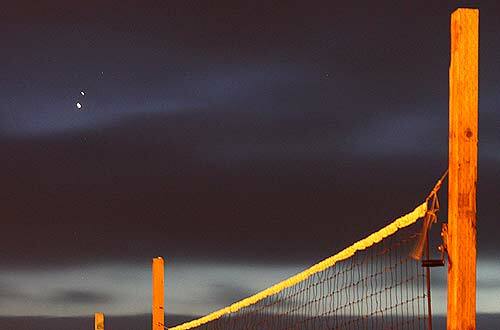 “Jupiter passed conjunction with the sun on August 26,” Todd said. “Jupiter rises about an hour before sunup. 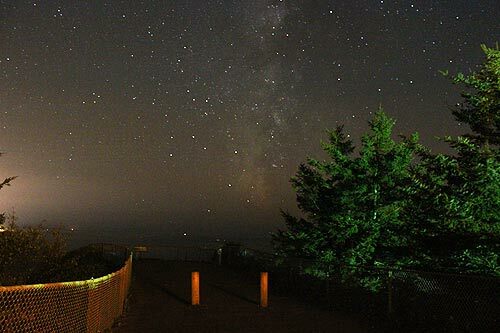 By month's end Jupiter will be rising more than two hours before sunrise and will be readily visible in the predawn eastern sky.” (Photo above: night skies near Depoe Bay at Cape Foulweather). Look for Mars as well, gliding in about 0.8 degrees to the north of Regulus, which is shining brightly as well. The Red Planet is about half a magnitude fainter than the bluish star. Those two are about 11 degrees down and to the left of Venus, and 10 degrees above and to the right of Jupiter. 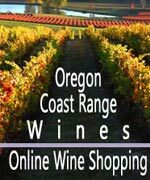 With the mountains to the east of the Oregon coast, this all may take a bit longer to see than those inland and in the Portland area. “On October 25, Venus, Mars and Jupiter will be in tight gathering for a spectacular morning display,” Todd said. Just before that, October 21 features the awe-inspiring Orionid meteor at its climax. On that night, just after midnight, you may see as many as 10 to 20 shooting stars per hour. That date is the peak, but the showers begin October 17 and go through the 25th. Ideal watching time, astronomers say, is between midnight and sunrise. It may help to gaze at the eastern horizon as the Orion constellation tends to be its radiant. Orion rises there and slowly trails upwards. More on Oregon coast science. More of the night skies from beaches below. 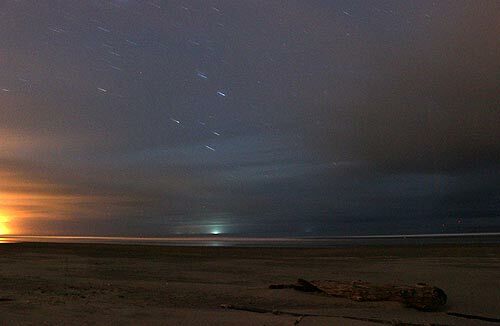 (Directly below: Venus and Jupiter in their convergence over the ocean, at Manzanita, back in June).